The simple thought of Thai food is enough to get me dribbling — fiery, powerful and intense flavours are the hallmark of Thai food, and, if executed well, they never fail to excite the eager palate. In search of a place that offers cheap and good Thai food, I visited Tuk Wan Kitchen in Sembawang. It’s a small restaurant, with about 30 seats. And on a Tuesday night, it was quite empty. The menu is incredibly extensive, and I wasn’t going to give myself a headache by looking through the entire thing. So I took the easy way out and just asked them to decide for me. Of course, you’re missing out on the full Thai experience if you don’t try the Tom Yum ($10.80). Mine came with seafood, but there’s also the choice of prawns or chicken. For $10.80, the portion was quite decent. Thick and rich with flavour, the soup was wonderfully aromatic and had quite the fiery kick. However, I found it to be teetering a little on the sweet side, and wished it had more of a sour tang. Still, the Tom Yum soup was nothing short of enjoyable and I savoured every spoonful. The true letdown, unfortunately, was the seafood in the Tom Yum. Excited by the sight of a large, bright-red prawn, I picked it up and started to peel the shell off but a wave of instant regret hit me. Instead of firm, sturdy flesh, my fingers dug into a mushy mess of disintegrated prawn. The squid wasn’t much better, each bite a hit of pungent fishiness. Perhaps stay away from the seafood option if you’re keen on ordering the soup. Another seafood option is the Live Crab ($50). It is served with a sizable Sri Lankan crab, and you can top it up with a very generous portion of fried glass noodles. Firm to the bite, the crab was pleasantly fresh. However, it could have done with a little more flavour and seasoning. But if you’re a crab purist, I guess you’ll like this. The glass noodles carried a strong seafood essence, presumably from the crab. I thought the flavour was a little one dimensional, but that’s just me. Overall, the dish is decent, and a good option if you’re dining with a large party of people. Much more delicious were the BBQ Grilled Pork Skewers ($7.80 for four pieces). Four pieces of lightly seared skewers, complete with a glistening coating of what was presumably oil. A harmonious blend of sweet, savoury and smoky, these were incredibly addictive. The pork boasted tender and juicy flesh – easy to get off the skewer stick, and even easier to chew. Dip the skewers in the sauce on the side to add a little tartness and acidity to the pork! To balance your meal, perhaps order the Thai Style Kang Kong ($7.80). Though a little on the oily side, I loved the numbing spice and piquant flavour of the kang kong. If you’re a spice-seeker, this will please you to the fullest. Carb (or crab)-lovers, there’s something for you too. The Bangkok Street Fried Rice with Fresh Crab Meat ($12.80) is, well, exactly that. Sure it doesn’t boast any extraordinary flavours, but it’s still fragrant fried rice with a hint of seafood essence. And that’s pretty much all I ask for in a plate of fried rice. Oh, and there’s quite a generous amount of fresh crab meat too! 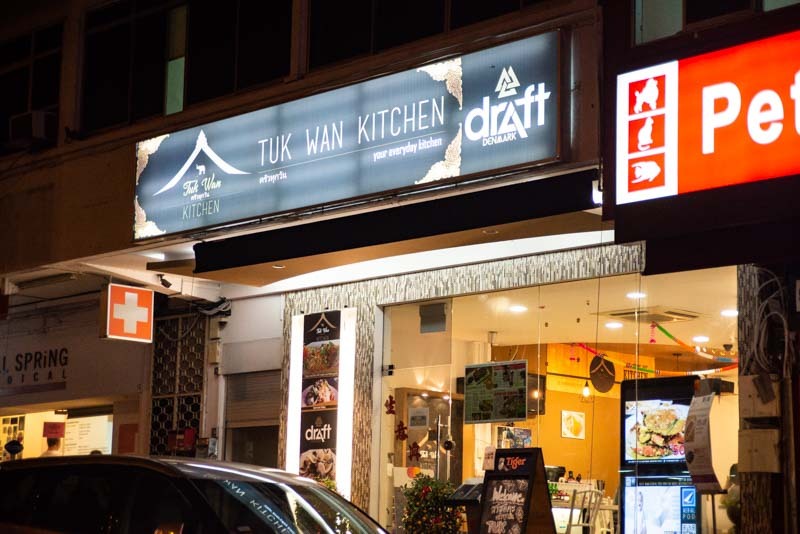 Though the food at Tuk Wan Kitchen can’t quite match up to well-loved places like Nakhon and Soi Thai, it is decent and the average Singaporean will enjoy it. Prices are a little higher, but you’ll be dining in an air-conditioned, quiet environment. It’s particularly appealing to those who live near Sembawang, so perhaps drop by for a visit if Sembawang’s your hood!